One day after giving a lecture I was sitting on a wooden bench under a Kadamba tree in the forest, watching a butterfly.It looked such a beautiful creation of God. She was drinking nectar from flower to flower and I was chanting my mantra. “Hare Krishna Hare Krishna, Krishna Krishna, Hare Hare/Hare Rama Hare Rama, Rama Rama, Hare Hare” very softly and very peacefully. I felt a million miles away from the city of Mumbai. Suddenly through the iron gates three of our students ran after me. I can practically hear their hearts pounding. One of them told me that this student was just riding in a train and there was a bomb blast. He saw some bodies hanging with blood streaming. There were businessmen and laborers. There were women running with little babies screaming and crying. There were also beggars. There was no differentiation. As they were speaking and explaining this to me, I got a phone call. I ran upstairs and answered. He was one of the leaders of Bhaktivedanta Hospital. He said, “You should see the scene here”. It is horrible. Practically every minute, bodies are being brought in by ambulances, by rickshaws, on people’s backs. All our beds are full and practically the entire floor space of the Hospital every inch is covered with whether injured or dead bodies. This was July eleventh 2006. It was announced officially that 209 people died and about 700 were injured. Thousands of people lost loved ones and millions were terrorized. There were seven blasts in seven trains in a matter of eleven minutes. I reflected and remembered the story that was told to me by one of my dearest friends and god brothers, His Holiness Sachinandan Swami Maharaja. His father was an officer in the SS – the hated Nazi killing machine. One of his friends who had directly taken part in killing thousands of Jews found colorful pictures of butterflies drawn by people who were about to die. There were colorful pictures drawn of butter flies in colored chalks, butterflies happily flying upward. It was such a joyful peace of the art in such a morbid dismal place of death. He was very curious. What does this mean? So he asked, several of the Jew’s. Why do you people draw butter flies week after week and months after months I see? There were new pictures of them. Most people would not answer but and old man he said, “Young boy, I’ll tell you”. That caterpillar puts in a very very painful situation, where he is wrapped up in something like a cocoon. It cannot move. It is very painful situation. 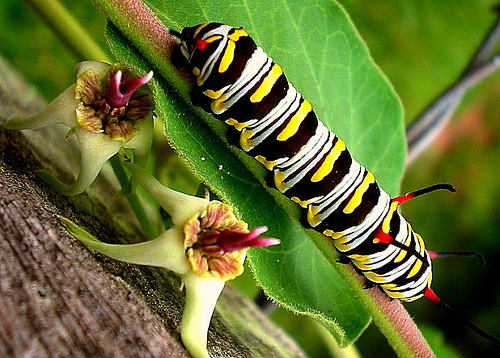 But through that painful experience, the caterpillar is transformed and comes out from that horrible situation as a colorful and beautiful butterfly. Now it is free to fly in the sky, bask in the sun, and go from sweet flower to sweet flower drinking nectar. We have this hope; you are keeping these caterpillars in these concentration camps of horrible imprisonment and suffering. But we have faith in God. Through our faith in God, we know for sure that we have the greatest hope because if we remember Him with devotion our death will be a transformation and our souls will be free. When this man heard it, it completely changed his view of the world. Previously he was brainwashed by Hitler’s propaganda to think that the Jews are subhuman and they are the agents of the evil. They were evil inherently. But see how these people had such a philosophy that gave them so much hot and internal joy, even when facing cruel imminent death. Interestingly the next generation the children of these people of Germany, they very much revolted against what their parents had done. One such revolutionary was Sachinandana Maharaja, who was searching for higher truth and searching for meaning. Then he come across Srila Prabhupada’s books and gave his heart to Srila Prabhupada. We are best friends. His father and relatives were exterminating the Jews by the millions. I was born in the Jewish faith. Many of my uncle and aunts were murdered by them. How it that we are best friends? That is the power of bhakti. We must raise above the past, present, mistakes in the form of ignorance, violence, hatred. We stand together with one voice and realize that we are connected. Every living being is part of god. “ahaà béja-pradaù pita”. Krishna tells in Bhagavad-Gita, “I am the seed giving father of every living being”. This is one small example of how hope can transcend all fear, all divisions.